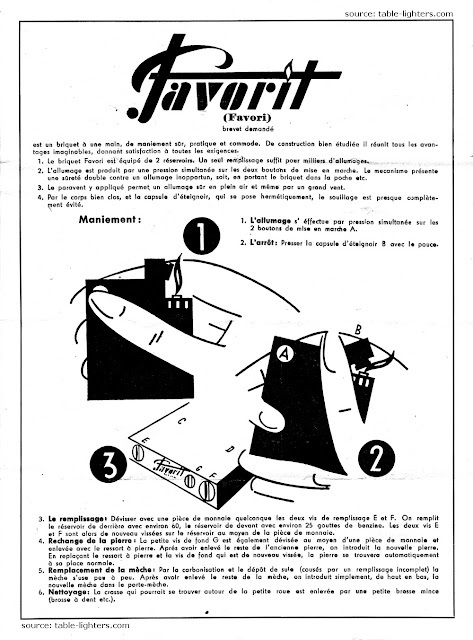 Cigarette Box and "Touchtip", model no. 16353. Chromium and black and white or tortoise-shell and ivory enamel. "Touchtip", model no. 2104. Enameled table lighter in black, white, turquoise, maroon, green or tortoise. Rondelight, model 14407. Table or desk lighter in black with chromium or colored bands. Beney Saville Super in Baron, Knight and Lady sizes (pocket lighter). Beney Saville Globe (desk lighter). If you make a donation of $5 and you get this and couple of other publications on lighters (for instance: Lighter Repair Manual) in PDF delivered to you by email! Thank you! 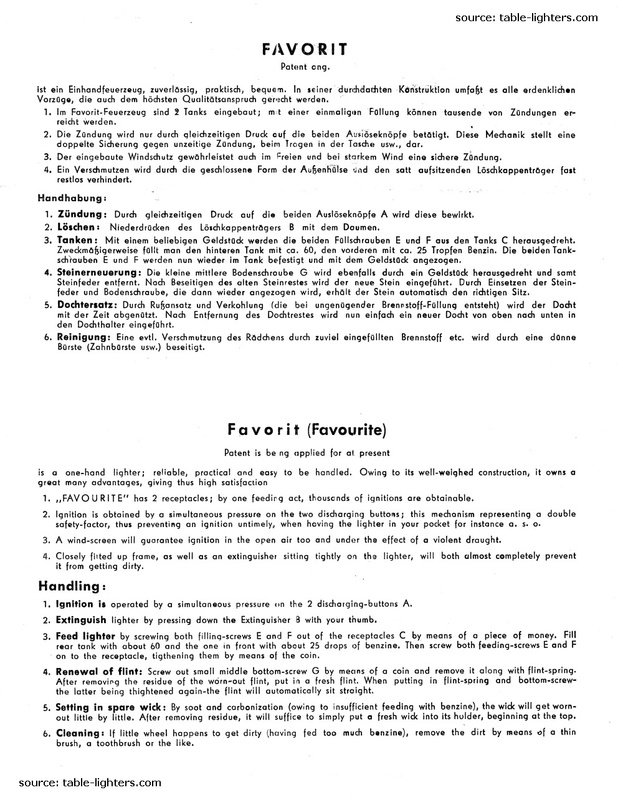 This instruction leaflet was added to all "Favorit" pocket lighters made by Adolf Kinzinger and Ferdinand Wagner (Pat. Ang.) in Pforzheim, Germany in the 1940s and 1950s. The leaflet was available in three languages: French, German and English. A black&white magazine advertisement published in The Saturday Magazine on November 1929. It depicts the Ronson De-Light Series including the table lighter Ronson Tabourette. This Ronson advertisement comes from the "Gift Book" catalog from the 1960. It depicts a part of the new Ronson Typhoon and Pioneer pocket and table/desk cigarette lighters range. 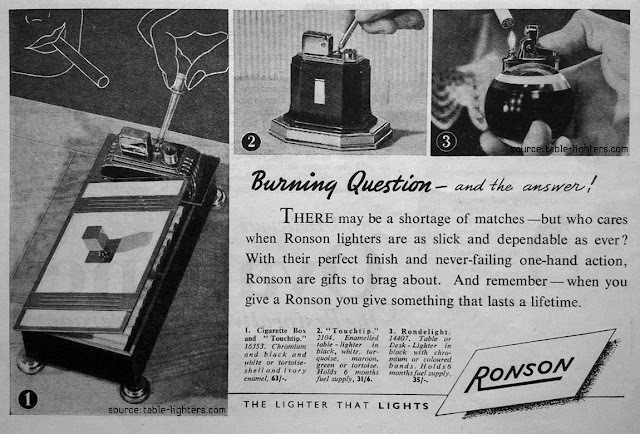 The Ronson Varaflame Claridge was first introduced in 1966 in England. The production ceased in 1969. The base of the lighter was made of two specially selected cotrasting woods. 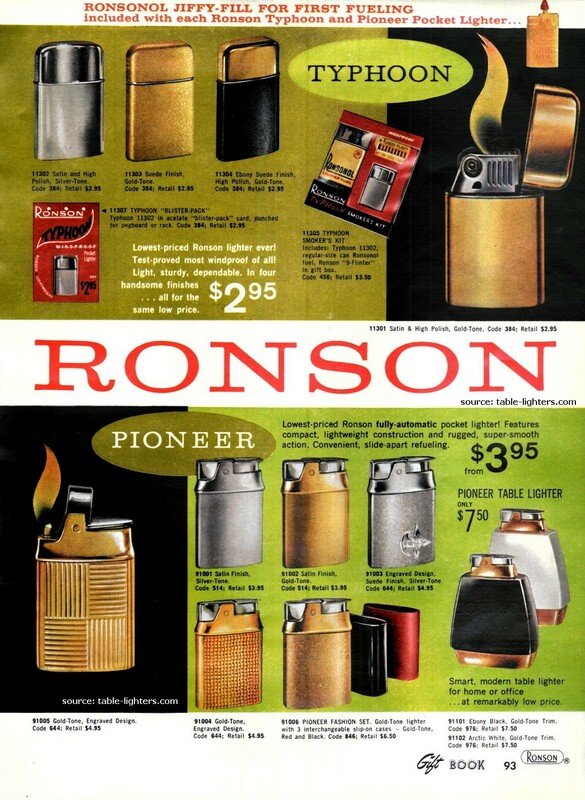 The curved design of the lighter is similar to the Varaflame Jupiter which also was manufactured in the 1960s. The removable lighter insert – the Varaflame – is chrome-plated and has a fingertip flame control. The insert is fastened to the base with a black plastic screw.